born November 23, 1913, Vysoke village, Kursk province, U.S.S.R.
Research Interests: Radio wave propagation and near-Earth environment physics. Kharkov A. M. Gorky State University, U.S.S.R. In 1963, Prof. Misyura V. A. took first in the U.S.S.R. incoherent scatter measurements. 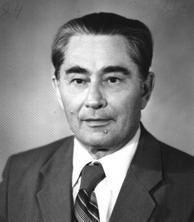 In the 1960s, the first in the USSR, Prof. Misyura disseminated and implemented the idea of the clustered-instrument investigations of the ionosphere. List of publications includes more than 400 publications almost entirely in Russian. 1. Misyura, V. A., Clustered-instrument radio investigations of the ionosphere, near-Earth space, and the propagation of radio waves from space vehicles (in Russian), Space Research in Ukraine. Space Physics and Astronomy, Kyiv, Naukova Dumka Press, 1973. Issue 3, pp. 3 – 20. 2. Misyura, V. A., Naboka A. M., Rozumenko, V. T., Tyrnov, O. F., The Propagation of Radio Waves in the Near-Earth Medium. Chapter I. Near-Earth Medium Electrodynamic Parameters, Structure, and Models (in Russian), Kharkov, Kharkov A. M. Gorky State University Press, 1991, 129 pp. 3. Misyura, V. A., Naboka A. M., Rozumenko, V. T., Tyrnov, O. F., The Propagation of Radio Waves in the Near-Earth Medium. Chapter II. Geometric Optics Equations (in Russian). Kharkov, Kharkov A. M. Gorky State University Press, 1991, 116 pp. 4. Misyura, V. A., Naboka A. M., Rozumenko, V. T., Tyrnov, O. F., The Propagation of Radio Waves in the Near-Earth Medium. Chapter III. The Theory and Simulation of Regular Propagation Effects in the Geometrical Optics Approximation (in Russian). Kharkov, Kharkov A. M. Gorky State University Press, 1991, 268 pp. Awards, prizes, honors. Ukrainian State Prize in Sciences and Technology (1989), Prize of the Ministry of Education for the best research in state hihger education institutions (1985), Prize of the Council of Ministers of the USSR, Colonel of the Soviet Air Force. Prof. Misyura V. A. was awarded the Order of the Motherland War, the Order of the Red Star, and eleven medals. He was made professor emeritus in Ukraine.